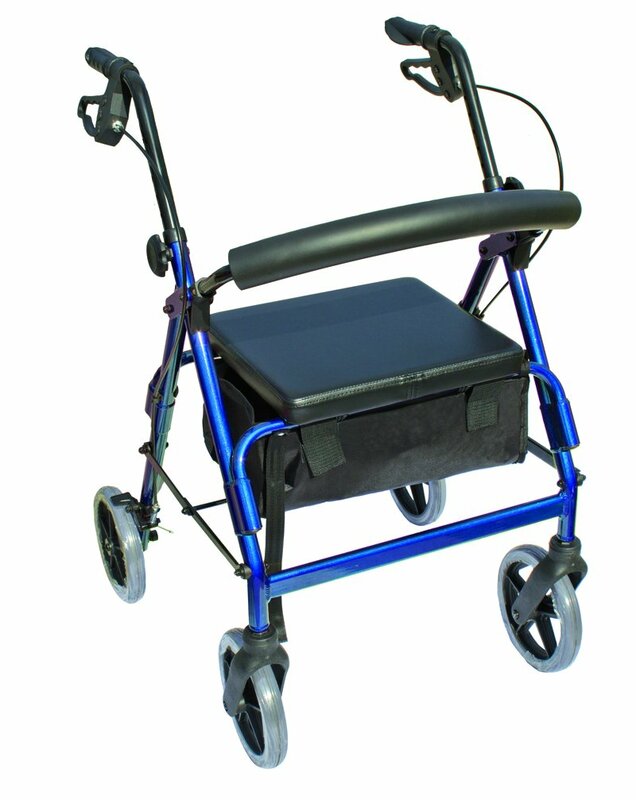 The Essential Medical Supply 4-Wheel Walker offers a modern option for getting where you need to go. It has a lightweight design that helps make it simple for you to move comfortably. The 4-wheel walker with seat and brakes features 8" mag wheels that are secured with loop lock brakes, providing a reliable performance that you can count on. When you get tired, just sit down and rest on the soft and comfortable 182 sq in seat. This home health care product has a rounded back bar that you can lean on for extra support as you relax. The bar even flips up when loaded into the car or when you're near a counter. It has a handy large vinyl pouch to hold accessories while staying easily accessible. The vinyl bag can be placed under the seat or in the basket since it comes with both. You can also use the basket to carry items and the pouch to secure your valuables. The walker folds compactly with an included folding strap and locking strap. This tool makes a helpful gift option for a loved one who has a tough time getting around. The ergonomic handles help ensure that you can hold it securely for extend periods of time. The Essential Medical Supply 4-Wheel Walker makes an ideal go-to option when you want to join in on the fun and shop or play. Overall Width (open): 23 3/4"
Width Between Handles: 17 1/2"